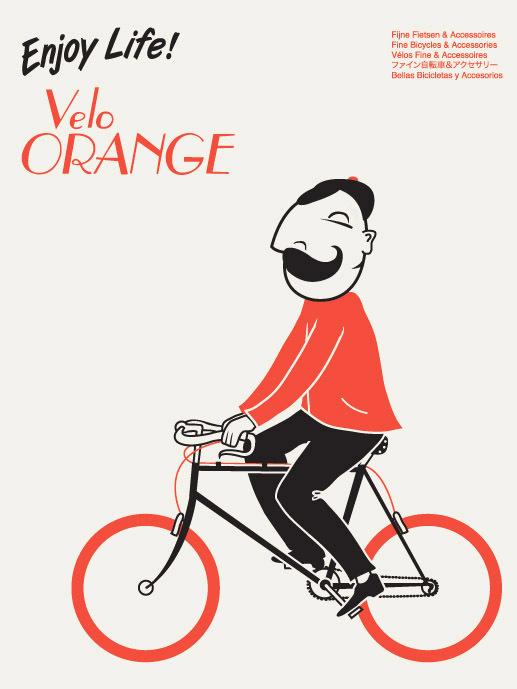 The winner of our handlebar naming contest is Postino, submitted by Jeremy (1/21/11, 3:47pm). If you could e-mail annette@velo-orange.com, we'll send the handlebar to you. We're all totally amazed at the number of really good suggestions submitted. I'll be traveling for the next week, so no blog posts. 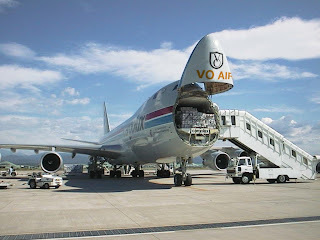 I also try to get away from e-mail when I travel, but VO's staff will be answering tech and shipping questions as always. Below is a shot of the Grand Cru cassette hub. I'll post more about it when I return, but here is one interesting point. This hub has four identical and rather large Japanese cartridge bearings. 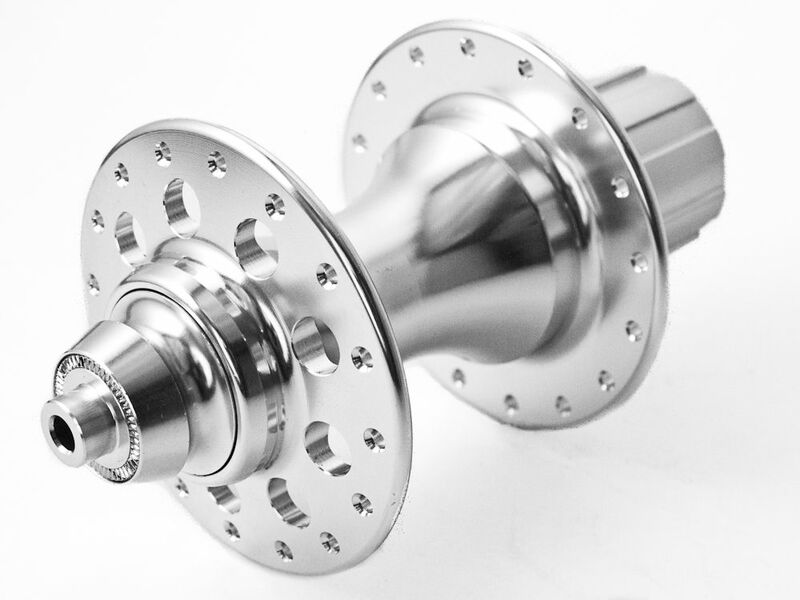 Most hubs with low flanges don't have room for four bearings this big, so we went with a large flange design. It's also nice that they are a common size and relatively easy to replace if they ever do wear out. I've had this old Italian handlebar for many years; it's the one on top. I really like it for a fast city bike and thought that VO should make something similar, the one on the bottom. It's much like our Milan bar, but with zero rise. It's actually designed from scratch, not based on the Milan, but the similarity is evident. We just ordered the first production run and hope to have them here sometime this spring. Update: Thanks for all the great name suggestions. The VO staff is considering them all and we'll pick the name today. Update II: Congratulations to Jeremy, who submitted the winning "Postino." At 22mm wide they are the perfect size for 28-38mm tires (though you could go a little bigger). I think 28-32mm is the ideal size for 700c road bikes. For me those sizes combine the light and lively feel I like with a good dose of comfort. They look great; the shape is simple and classic. And the high polish finish is stunning. They are box section rims with double eyelets and that makes them very strong. I won't hesitate to ride them on unpaved roads or on a loaded tour. The brake surface is a little taller than on classic rims. This makes brake setup easier. Based on our other rims from the same factory, they should consistently be very round and easy to build up. 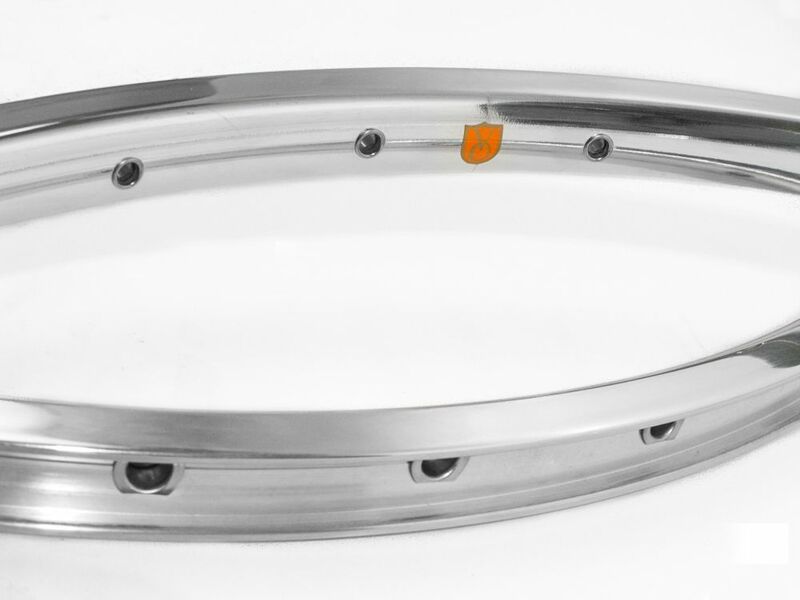 They are a bit dear at $78, but that's because we paid a lot for the tooling for the rim extrusion and for the tooling for the double eyelets.The polishing is also not cheap. So I think the price is more than fair. 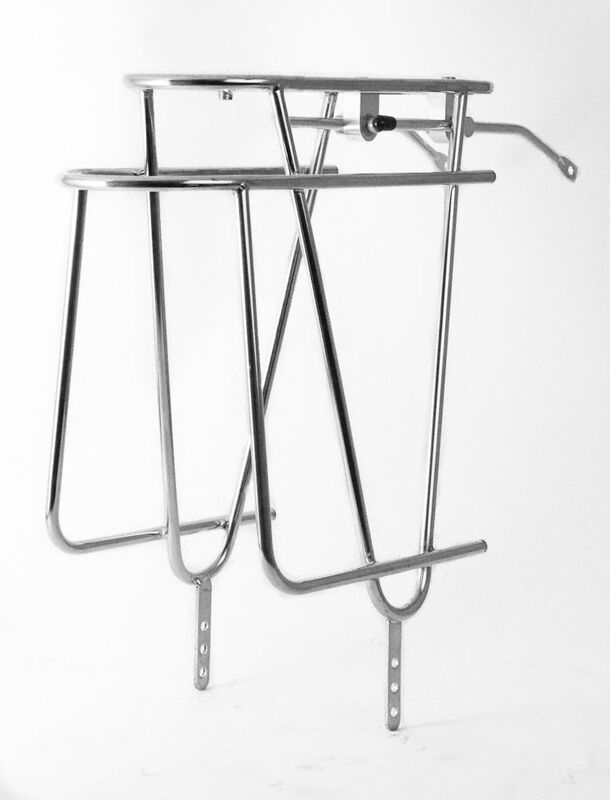 These are our new loaded touring racks, or at least the prototypes. These versions are pretty good, but not perfect. 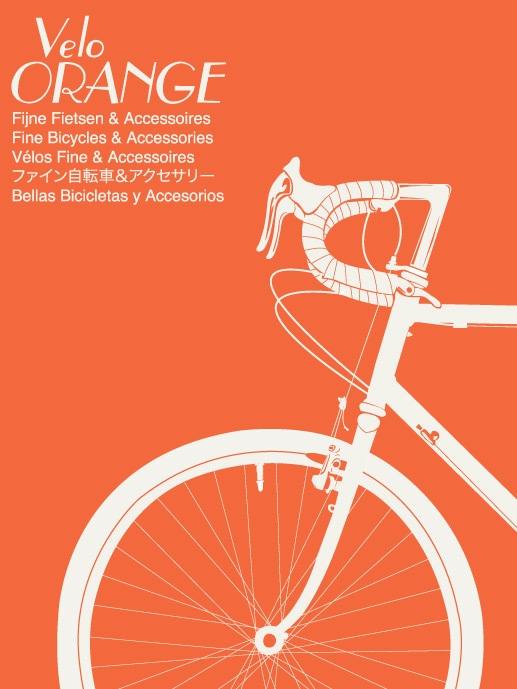 The front rack is very close and, if testing goes well, might make it into production this spring. The rear rack will need at least one more prototype to get it perfect. We tried to make the racks in the style of French constructeur racks. 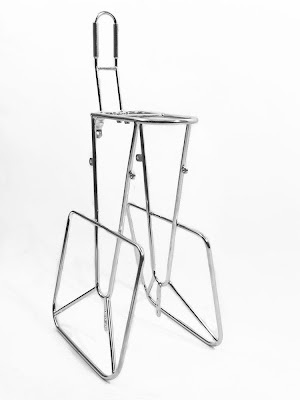 We studied hundreds of photographs and drawings of classic touring racks before designing these. 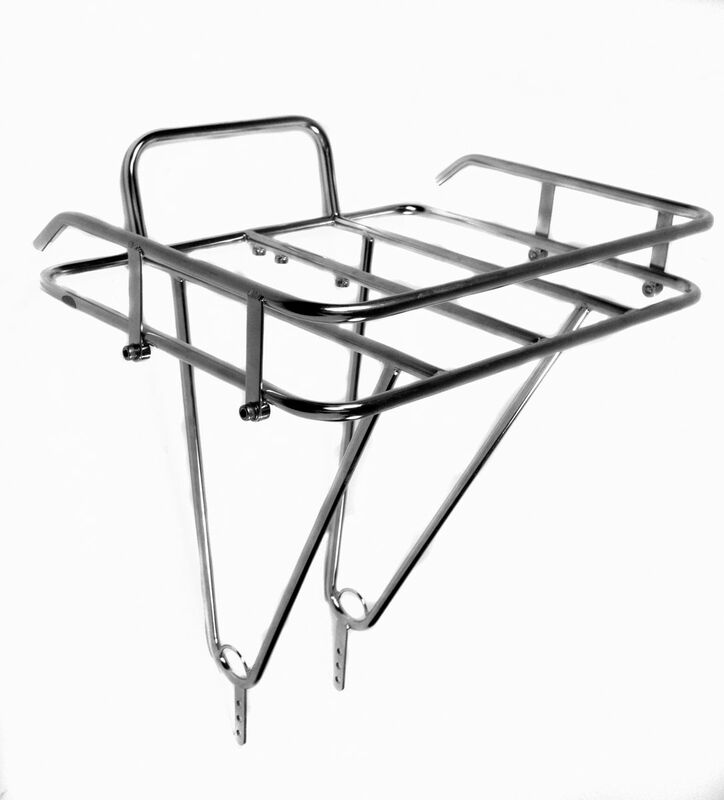 The front rack has an integrated decaleur and low rider frames. It can be mounted to the fork crown, to low-rider bosses, or to both. The rear rack has a lower rail that wraps around the rear fender. This makes for an exceptionally stiff rack. 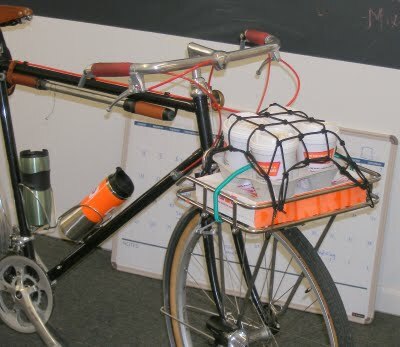 It also allows the panniers to be lifted off without disturbing the load on top. Finally, the lower rail allows for a lower center of gravity and better handling. They are made of stainless steel and the workmanship is really nice. Don't ask me about price; I don't know yet. Here are a few notes about arriving items and new products. We've been out of a few things due to the holiday rush so we arranged an air shipment. 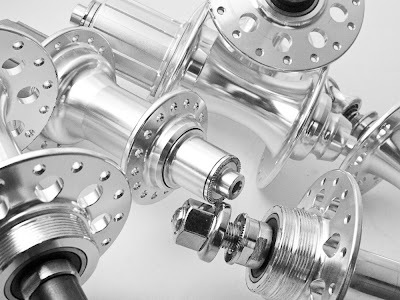 The following should be back in stock within the next couple of weeks: BBs in many sizes, Grand Cru headsets, VO touring, road, and city pedals, cargo nets, wheel stabilizers and stems. Our new Raid rims should be here within days. They are a strong double-eyelet box section rim. The width is 22mm and they look like a wider version of the PBP rim. I think this size falls right the sweet spot in rim width and in strength-to-weight ratio. I'll post full details and photos when they arrive. We'll also be getting the new switchable dyno hubs very soon, at least the first small shipment. The rest of the production run will arrive in March. Again, I'll post full details only when they arrive, but here is a photo of one of our test units with a few thousand miles on it. March will see many new products arriving by ship, two containers worth actually. The most exciting of these are probably the new Grand Cru hubs. 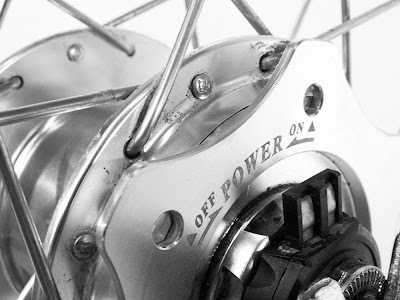 The high flange cassette version won't be done in time, but the freewheel, high-low, and fixed hubs are almost ready. 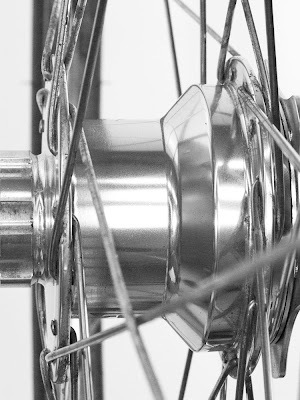 The long awaited VO and Grand Cru chrome stems will, with a bit of luck, also be ready in time to sail. And, finally, the single speed version of the Grand Cru 50.4bcd crank is nearing completion and should be aboard. The poster below were made by Dylan. He's a graphic designer who's "trying to get an illustration career going." 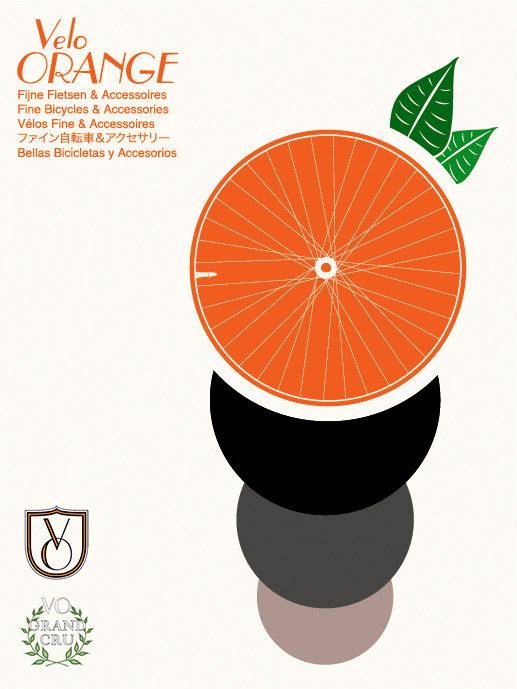 We really like them and think they fit right in with the VO style. 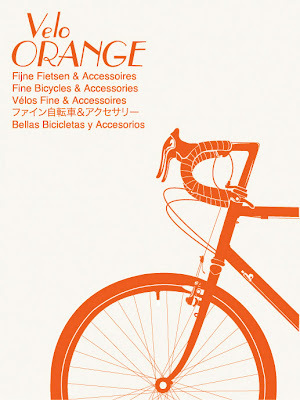 Remember those great posters from French and Italian bike companies? Might be time to bring them back. Which one is your favorite and should I have some printed? UPDATE: Almost everyone like them so we'll print some, probably the top three. Our coupon code flash sales have proven very popular, so we'll do one every few weeks. 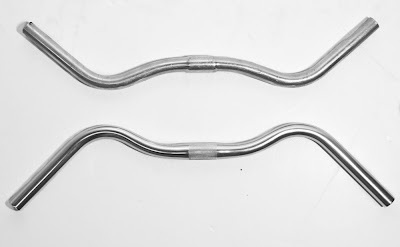 This one is good for $40 off the VO Porteur Rack, with or without rail. 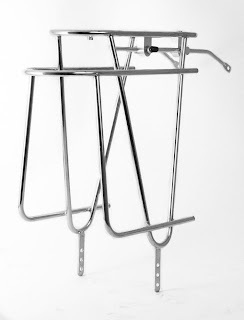 This is a traditional-style Porteur rack as used on the famous Parisian newspaper delivery bikes. Those Parisian delivery bikes were reputed to carry as much as 110lbs of newspapers on similar racks, but of course they had strengthened bike frames and forks, not only racks. 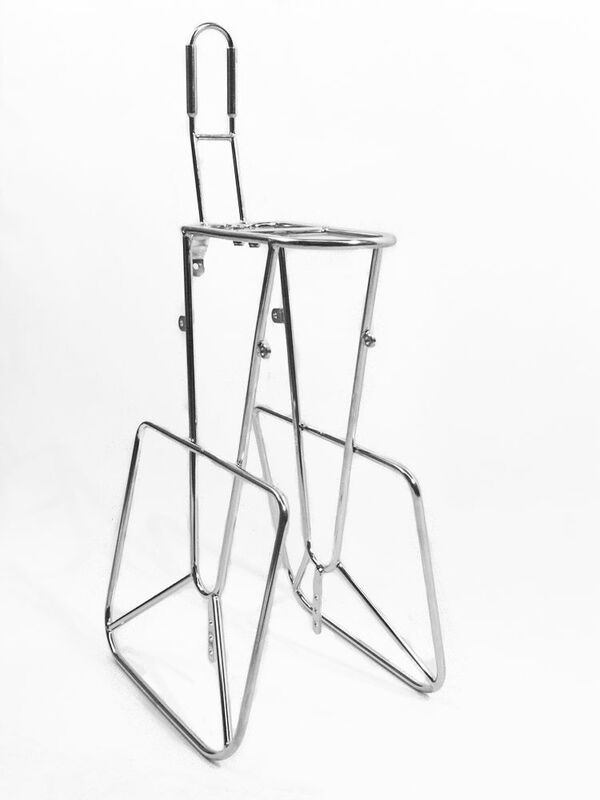 The VO porteur rack is made from strong stainless steel tubing and polished to a lovely shine. It won't rust like painted steel racks or fatigue and crack like aluminum racks. The quality is actually superior to that of many custom racks. In short, this is a real load-carrying rack, not an aluminum "style-rack". The platform is about 36cm x 29cm. The tangs are pre-drilled to fit 700c, 27", 26", and 650b bikes. There are four bosses for light attachment. There is a boss for securing your fender to the rack, no rattling. Please also note the elegant pannier/tie-down loops above the mounting tangs. Mounting hardware is included. The Porteur rack mounts to the dropout eyelet and the brake bolt (or fork crown hole). The coupon code is "bigload". Click on "My Cart" (not "Checkout") on the top right of the screen to enter a coupon or a gift certificate. The sale runs from midnight Friday (1-7-11) to Midnight Sunday (1-9-11) Eastern US time.